Let's Learn and Reduce Food Loss! Did you understand the situations of food loss in the world especially in Japan? Food loss is deeply connected with our lifestyle, and there is responsibility for all individual persons on this planet to reduce it. Here, we propose what we can do now. To reduce waste of food, you have to be careful of what you buy at shopping. 1. Look around the kitchen and check what is necessary. Checking how much food is in your refrigerator, you can reduce food waste at your shopping. 2. Buy food which its use-by date or expiration date is close and eat early. If you want to buy fresher food more than you need, some products you are still able to eat safely would be thrown away. 3. Not buy too much on sale. On sale, people tend to buy products not necessary for them. Before buying something, you have to consider whether you need them. 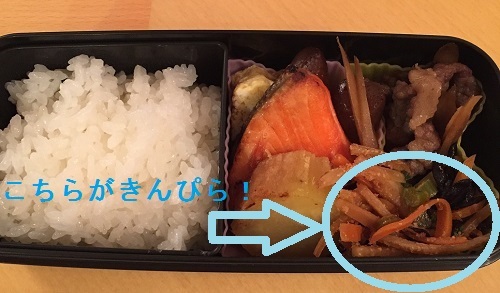 Some stores in Japan have already tried some activities to reduce food loss. Look at the picture below. This picture was taken in the supermarket near a member of our group’s home in Chiba. 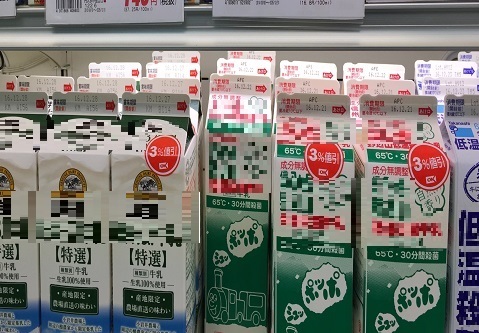 Milk cartons with stickers were discounted by 3%. A salesperson told her that they sell relatively old and safety food cheaper than the list price. Also, at this supermarket, you can buy vegetables and　fruits with some damage cheaper. It is effective, and easy for consumers to cooperate with the stores. Unless you have enough knowledge about keeping food, it will go bad and will be thrown away. First, you must understand the difference between use-by date and expiration date. 1. Use-by date...you can eat safely for this term. If food is over its use-by date, you had better not to eat uncooked one. 2. Expiration date(best-before date)...you can taste food nicely for this term. If you find food whose best-before date has passed, you should check by yourself whether you can eat safely or not. 1. Seeing...check whether food change its color, it is moldy, and surface is shiny. 2. Smelling...check whether it smells bad. 3. Feeling...check whether it is elastic. *Be careful of your health when you eat such food. It is also important to keep food fresh. Let’s learn about how to keep food! Refrigerators have some room to keep food effectively. Here is basic knowledge about each of rooms. 1. refrigerating chamber...In this room, food is made and kept cold. Internal temperature of this is about 2‾6 degrees Celsius. 2. chilling chamber...Internal temperature of this is about 0‾2 degrees Celsius, lower than refrigerating chamber. *Food containing water is not suitable to keep. 3. vegetable compartment...Internal temperature of this is about 3‾8 degrees Celsius, higher than refrigerating chamber. 4 freezer...It freezes food rapidly and preserve it from decay. Internal temperature of this is about -20‾- 18 degrees Celsius. *Do not keep milk and an egg in this room because it lowers the quality of them. 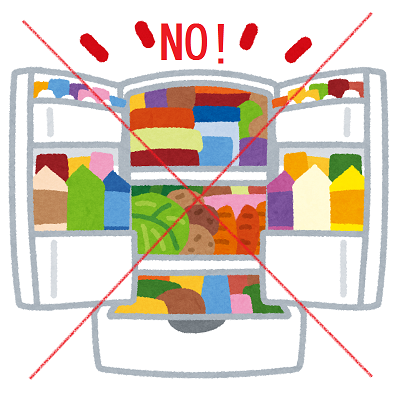 Do not pack food into the refrigerator. Also, you should be careful not to open and close the door frequently. Have you made a meal from leftovers? There are many recipes called “arranged recipes” in the world. In November 2016, we have tried cooking two dishes from vegetable waste and remains of bread. 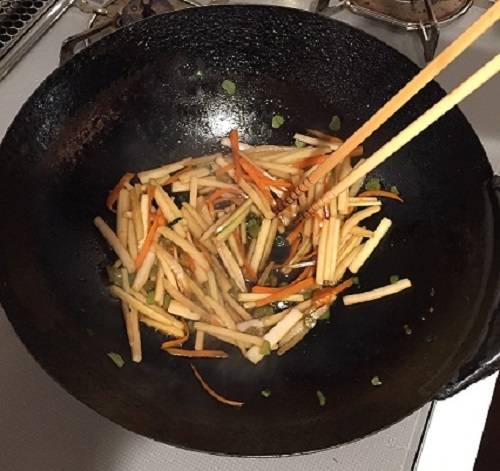 We used the skin of daikon, Japanese vegetable instead of burdock roots. 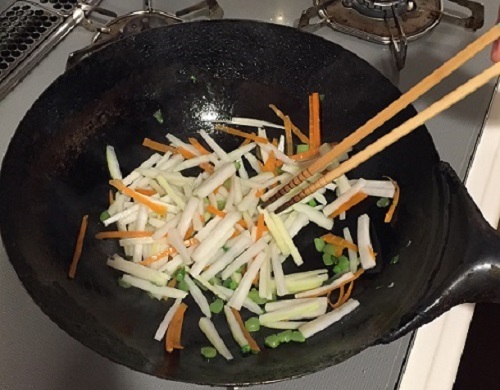 Using the whole daikon, this recipe is eco-friendly! 1. 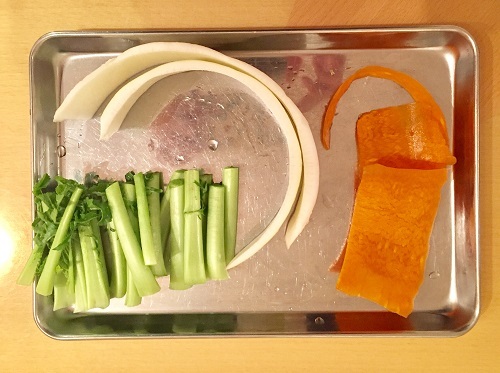 Cut the skin of daikon and carrot into 3 to 5-centimeter width. 2. 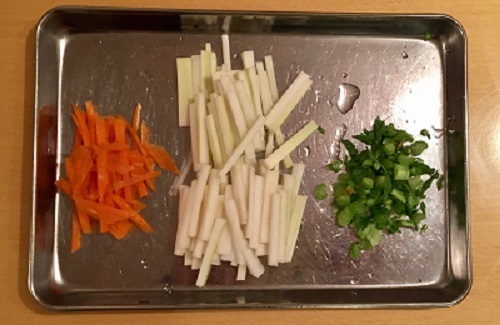 Chop the leaves of daikon into pieces. 3. Mix soy sauce and honey. 4. 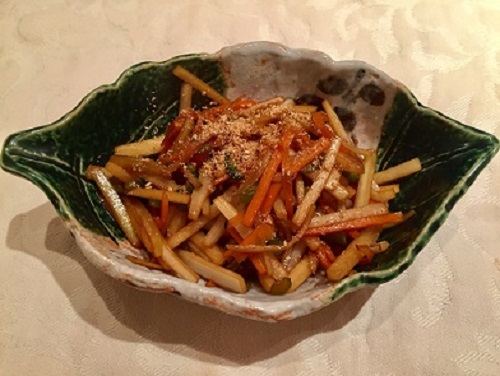 Fry cut vegetables in sesame oil. 5. After they are tender, toss mixed sauce with fried vegetables on a pan. 6. Serve in a bowl. It was very easy to cook with this recipe and so much fun! We brought it to the school as lunch, then, friends liked it. We can make remaining bread delicious even if it is hard. 1. 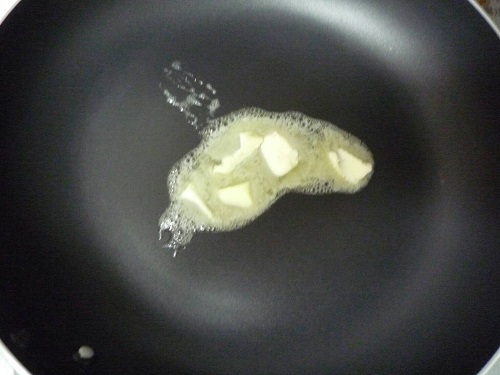 Heat butter or margarine up on a pan. 2. 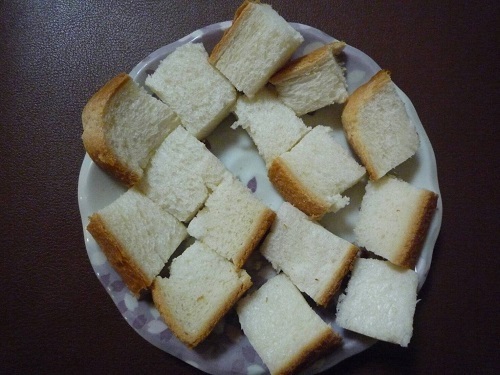 Cut bread into bite-size chunks and heat them up for 1 minute 30 seconds in the 800w microwave. 3. Turn them over, and heat them up for 30 seconds. 4. 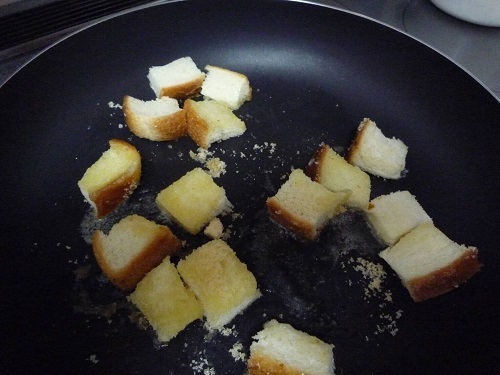 After butter or margarine melt, toss the bite-size bread with it. 5. 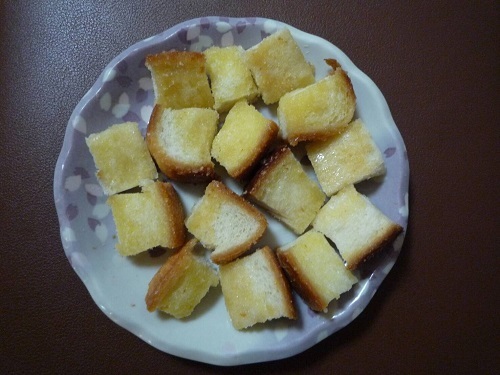 Toss sugar with fried bread. 6. Serve in the bowl. We recommend this as snacks for children. It is safe for them to cook because they can do without using knives. It is very difficult to reduce food loss. As mentioned so far, people are likely to make food loss before they know it. However, there is an effective way to reuse that loss —it is to make compost. Would you like to try to make compost? There are many procedures to make compost. We will present an easier way that uses a planter. However, you cannot use cooked food because they contain salt and oil which are harmful for soil. Meat and fish are easy to turn bad and often attract insects. Therefore, beginners should choose raw vegetables to make compost. 1. Put soil into a planter. 2. Dig soil and put garbage that is drained well into the hole. 4. Please stir from time to time about once a month. 5. Use compost mixing with soil. We tried producing compost. 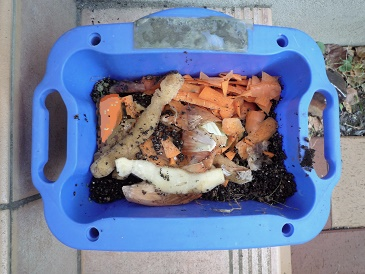 We used skin of carrots and Chinese radishes to make compost. 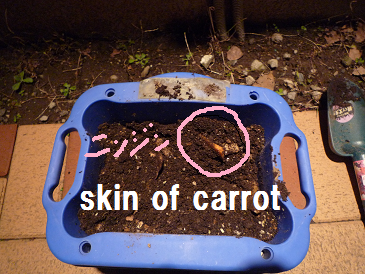 ↑Just put skin into a planter. After that, we stirred soil once a week for a month. ↑The picture of planter after a month. We introduced what we can do in our homes. Then, let’s learn about some activities or campaigns in our society. Do you know "food bank"? 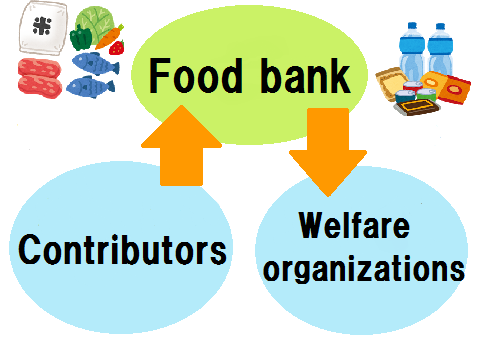 Food banks collect unsold or uneaten food and give them to organizations that help people who need help. By sending food what might be thrown away although it is safe to food banks, we can help people who can’t get enough food. Food banks receive food sent by farmers or company and donate it to some welfare organizations. It can contribute not only to reduce food loss, but also to help people to get enough safe food. However, not so many Japanese people know about food banks. So, we think we must tell food banks to our friends or families and raise people’s awareness toward reducing food waste.